The Democrats won’t say a word about this. 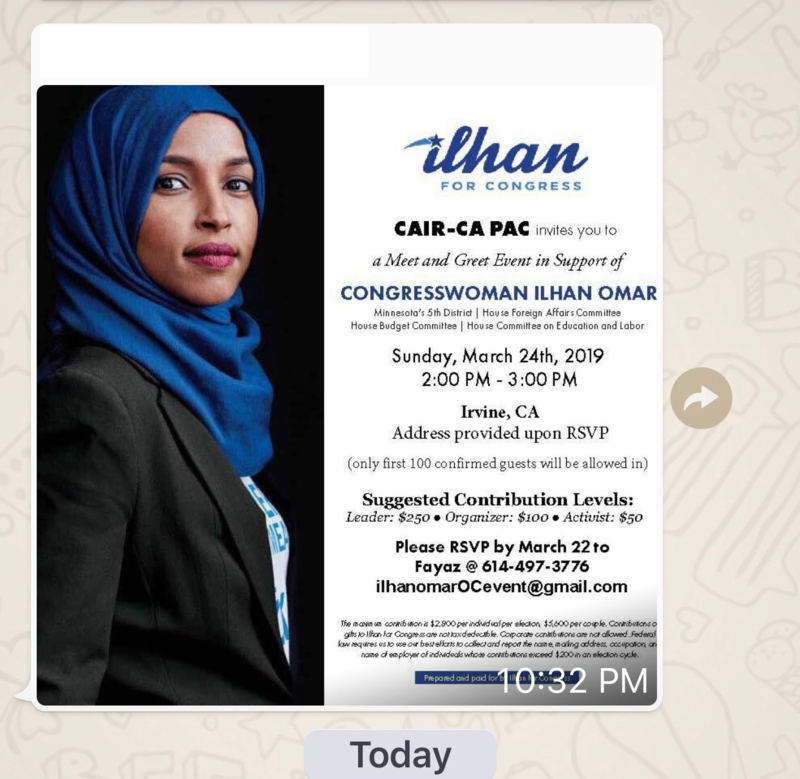 They have already learned that nothing negative whatsoever can be said about Omar, on pain of charges of “Islamophobia.” And support for Hamas-linked CAIR is mainstream among the Democrats. They routinely appear at CAIR events and have no apparent interest in what the group is all about. CAIR is an unindicted co-conspirator in a Hamas terror funding case — so named by the Justice Department. CAIR officials have repeatedly refused to denounce Hamas and Hizballah as terrorist groups. Several former CAIR officials have been convicted of various crimes related to jihad terror. CAIR’s cofounder and longtime Board chairman (Omar Ahmad), as well as its chief spokesman (Ibrahim Hooper), have made Islamic supremacist statements about how Islamic law should be imposed in the U.S. (Ahmad denies this, but the original reporter stands by her story.) CAIR chapters frequently distribute pamphlets telling Muslims not to cooperate with law enforcement. CAIR has opposed virtually every anti-terror measure that has been proposed or implemented and has been declared a terror organization by the United Arab Emirates. CAIR’s Hussam Ayloush in 2017 called for the overthrow of the U.S. government. CAIR’s national outreach manager is an open supporter of Hamas. CAIR, a Muslim advocacy group known for its anti-Israel positions, was named by the U.S. government as part of a large network of groups known to be supporting Hamas….